Exclusive hire of Château Mader for a long “Wedding” weekend of 3 days 2 nights offers you the time, space and decor of a grand Belle Epoque villa for an unforgettable wedding: Magnificent gardens for ceremony and cocktail, splendid salons for reception and dance, rooftop terrace with sea view for photos and luxurious suites to accommodate your loved ones. Your wedding deserves Château Mader! 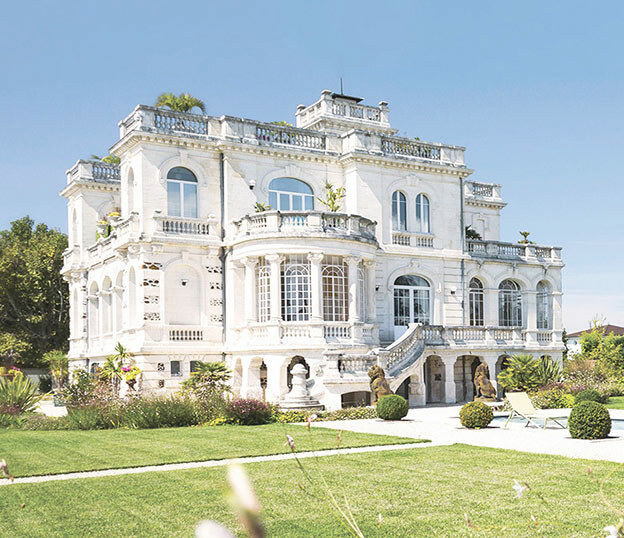 For a self-catering weekend or weekly rentals for up to 18 people in the heart of Arcachon Bay, close to small harbors with colorful oyster shacks, Château Mader offers you the 5-star comfort of a magnificent Belle Epoque villa and a lush garden to unwind, tan and relax in a shallow pool and spa. A rare alliance of luxury and relaxation! Receive partners, clients and employees in a refined environment for your events: Executive Committee, seminar, cocktail and reception. Together, let’s create a tailor-made event! 2018: The abandoned site bothered a builder whose wife, daughter of oyster farmers, once frequented this local heritage gem. Builder of luxurious mansions in California, he brought splendor and comfort back to Chateau Mader to accommodate high-end weddings and stays and thus ensure its future. Rated by the Ministry of Tourism the unique 5-star chateau of Arcachon Bay!